Bone Broth is a staple in the traditional foods kitchen, and a staple in kitchens all across the world. Its savory, umami-rich flavor helps to give depth to soups, stews and sauces, while its high protein content helps to extend the protein we get from other foods, like beans and pulses. Properly prepared, bone broth is a wholesome and delicious, protein-rich food that is also relatively easy and cheap to make. Of course, what you’re after when you make bone broth is not only a marvelously rich flavor, but also a luscious, silky texture that gives soups, stews, sauces and sipping broths body. That body comes from gelatin, and bone broth makers are always looking to simmer a broth so that it produces a fine gelled structure, sometimes bouncy and sometime sloshy. It can be terribly disappointing for new broth makers to fail to get that delightful jiggle in their broth. Bone broth gels because collagen, a structural protein found in connective tissue on meaty and gristly bones, breaks down with prolonged cooking, dissolving into the cooking medium. When the resulting broth cools, the proteins realign themselves and produce a fine, bouncy gelatin. A good gel is a sign of a good broth, because it signifies that the broth is particularly rich in protein and because that gel, when it reliquifies with heat, gives broth body and an appealing mouthfeel. First, if your bone broth hasn’t set up and doesn’t gel, it’s still perfectly fine to eat. It may not be particularly rich in gelatin or protein, and it will certainly lack the body of a properly prepared broth, but there’s no sense in throwing it away. Many factors influence whether or not your broth will gel, and just a few tweaks in how you select bones for your broth pot, the volume of water you add, how long you simmer your broth and at what temperature you do so may make the difference between a thin, watery broth and one that bounces like the Jell-o you ate as a kid. 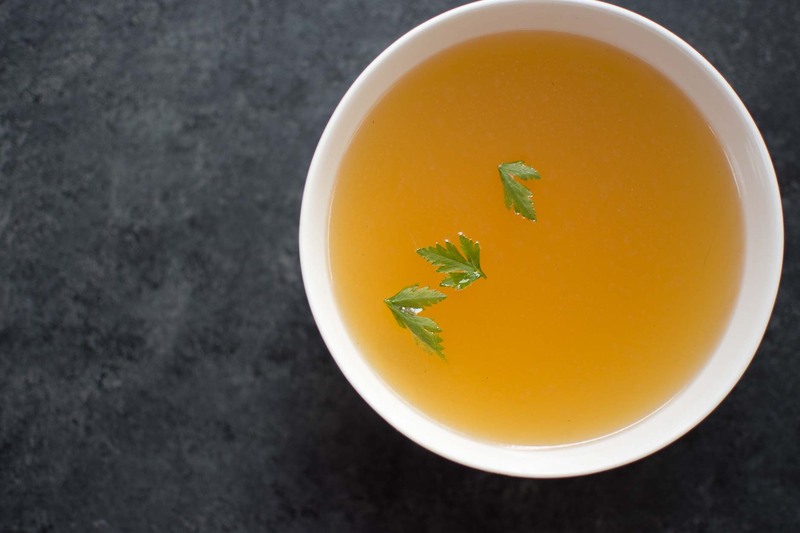 Bone broths get their gelatin from the collagen in connective tissue, and they get their flavor from meat, and the meat of well-worked muscles like shanks and necks are particularly flavorful. Not all bones are rich in collagen, nor do all bones arrive with meat adhering to them, so to make a good pot of broth, you’ll need to select a variety of bones to give you that balance of collagen-rich connective tissue and flavor-rich meat. Marrow bones, though popular, aren’t a particularly good choice for broth making as they lack both the connective tissue that gives good bone broth its gel and meat that gives it its flavor. Tucking one or two into your broth is a good idea, but simmering a full pot of marrow bones won’t yield a good broth. Instead, try roasting them or making them into a sweet bone marrow custard or a savory one. Beef, Bison and Lamb Bone Broths: A combination of neck bones, shanks, oxtails and knuckles work particularly well. Chicken, Duck and Turkey Bone Broths: Use the whole bird, the frame of a roasted bird as in this turkey bone broth or this chicken stock, and toss in a few chicken, turkey or duck feet if you like. You can also make a broth purely from chicken feet. 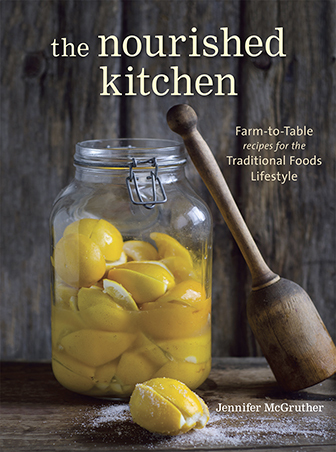 If you’ve pieced your bird, keep the wings, feet, neck and back for bone broth, and make kitchen scrap broth in this cookbook. Pork Bone Broth: To make pork bone broth, use neck bones, hock and feet. If you can find them, pig ears also make for a nice broth. Adding too large a volume of water to a small amount of bones will yield a thin broth that won’t gel properly. You’ll extract the collagen from the bones you use, but it will be too dilute to give you a solid gel. Fill your pot with bones, and cover them with clean water by two inches. This is generally sufficient enough water to extract the collagen from the bones and make a deeply flavorful broth without being so large a volume of water that your broth will lack flavor and a nice, gelled structure. Adding an acid, like vinegar or wine, to your bones and water will help extract the collagen in the connective tissue that adheres to those bones. Despite what you may have read elsewhere, an acid added to the broth pot won’t reliably extract minerals or produce a mineral-rich broth, but it does help to efficiently extract collagen. Acid is also used in the commercial production of gelatin from beef hides. Many broth makers will add apple cider vinegar to the broth pot, because it’s inexpensive or because they’ve read Nourishing Traditions. I find that the flavor is improved when you use wine, not vinegar, to make bone broth and stock and recommend it in my cookbook: Broth and Stock. So if you’ve popped open a bottle of wine to drink with your dinner, save a cup for the stock pot. A French proverb warns that, “To make a good soup, the post must only simmer or smile.” In clearer terms, take care not to overboil your broth! Heat helps to extract collagen from connective tissue, but prolonged exposure to high heat can also break down the structure of that protein so much that the broth fails to gel, and often gets cloudy too. When making broth on the stove, bring it to a rolling boil over hight heat, and then immediately turn down the temperature to low or medium-low and let it barely simmer, uncovered. This is generally not an issue with broths cooked in the pressure cooker, but it can be an issue with broths cooked in a slow cooker. If you’re using a slow-cooker, cook the broth on high until it reaches a boil, and then continue cooking it on low. It takes time to soften connective tissue and to extract collagen from it. If you cook your broth for too short a period of time, your broth will lack protein and gelatin. Yet, if you cook your broth too long, it will develop overcooked, off flavors that can become particularly unpleasant if you’ve added vegetables to the broth pot which tend to breakdown, tasting at once bitter and overly sweet. So how do you know how long to cook bone broth? The amount of time you need to cook broth depends on the kind of bones you’re using: The smaller the bones, the shorter the cooking time and the larger the bones, the longer the cooking time. So what’s the right time? Chicken, Duck, Turkey and Goose Broth: Simmer these broths at least 4 hours and up to 12 hours. Pork and Lamb Bone Broth: Simmer these broths at least 6 hours and up to 18 hours. Beef and Bison Bone Broth: Simmer these broths at least 12 hours and up to 48 hours. Remember, if your broth didn’t gel, you can still use it. But, if you’d still like that wonderful bounce, I’ll give you a little cheat: Add a bit of gelatin! Bring a quart of broth to a boil on the stovetop. As the broth warms, dissolve 2 tablespoons gelatin (I use this brand) into 2 tablespoons water. When the broth boils, stir in the softened gelatin until it dissolves completely. Turn off the heat and either serve the broth immediately, or transfer it to the fridge to cool. 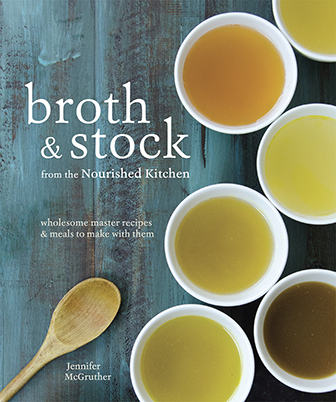 My second cookbook, Broth and Stock, will give you plenty of tips for making wholesome, tasty bone broths and stocks and there’s lots of troubleshooting and tips, too. You can find bones for broth making at most farmers markets, at natural grocers and online. An electric pressure cooker makes excellent, easy, no-fuss bone broth that generally gels really well, and you don’t have to worry about monitoring cooking time or temperature. If you don’t want to make your own broth, or don’t have time to, it’s worth having a traditionally prepared, slow-simmered broth on hand like this one. I agree that the Kettle and Fire bone broth is very good, however it is also very expensive (even on sale). Make sure you look at the size of the carton (I didn’t and was surprised when it arrived how small it was) before you order. Also, they don’t ship to Canada……. Yes, Kettle and Fire IS expensive, but that’s the exchange your really have to make. At any given moment, we’re balancing time, quality and money. So, when making broth at home, you choose quality and economy and don’t have the benefit of saving time. When choosing a long-simmered broth like Kettle and Fire, you’re choosing quality and saving time, but won’t be saving money. When choosing a low-quality broth from the store, you’re choosing to save time and money, but at the expense of good quality and nutritive value. So, either way, you have to make a decision and determine your priorities. Thanks for the article. Lots of helpful information. What do you think about the nutritional value of perpetual broth? Without having it tested, it’s really difficult to say. I used to do perpetual broth, but stopped a few years back. Now I just make it more frequently, or use a purchased, traditionally prepared broth. Perpetual broth is kind of like french remouillage, which is a broth in which you reboil bones from a previous batch of stock – it still has something to give, but is likely not as much as the first batch. That was really helpful information. I love making my own bone broth but didn’t know about the wine/vinegar addition. I always look forward to seeing the Nourished Kitchen email in my inbox! How long should chicken broth cook in an Instant Pot pressure cooker? I cook it for 90 minutes. I used a carcass from our thanksgiving dinner. I simmered it for over 48 hours. When I tried to extract the marrow from the bones, they just dissolved. I was only able to remove a nandfull of bones, the rest dissolved into the broth leaving a thick creamy soup. It is delicious, and I cooked navy beans right into the broth. My question is; is this normal (bones dissolved into the broth)? Is it a problem (did I have the carcass of a sick turkey)? Should I discard the soup?